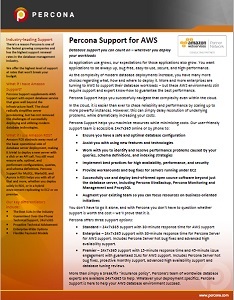 Below are a list of datasheets for Percona's software and services. These provide details on the value of our open source software and expert services. 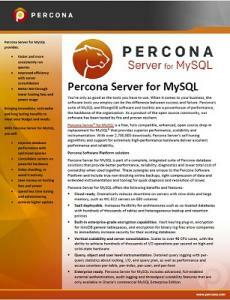 Percona Support for MySQL provides you with real-time electronic and phone access to our expert technical team. Our 24x7x365 online and phone access policy ensures that you can always reach one of our technical experts, not an answering service. Our phone and chat lines are served by our amazing technical experts who can immediately engage with you on support requests. 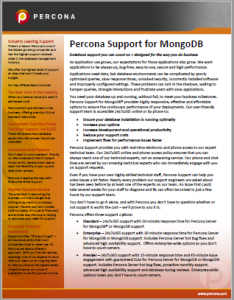 Percona Support for MongoDB provides you with real-time electronic and phone access to our expert technical team. 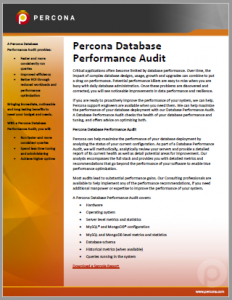 Percona can help maximize the performance of your database deployment by analyzing the status of your current configuration. 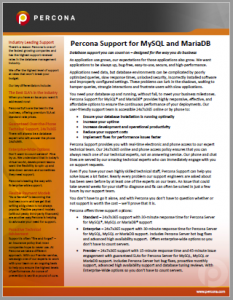 Percona Server® for MySQL is a free, fully compatible, enhanced, open source drop-in replacement for MySQL® that provides superior performance, scalability and instrumentation. Percona Server® for MongoDB is a free, enhanced, fully compatible, open source, drop-in replacement for the MongoDB® Community Server that includes enterprise-grade features and functionality. 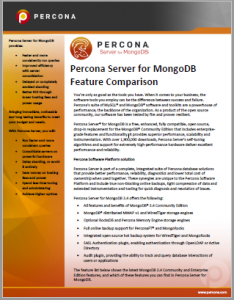 Percona Server® for MongoDB is a free, enhanced, fully compatible, open source, drop-in replacement for the MongoDB® Community Edition that includes enterprise-grade features and functionality. 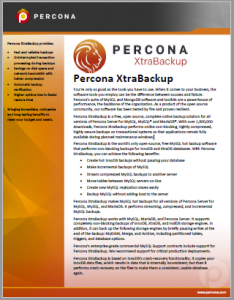 Percona XtraBackup is a free, open source, complete online backup solution for all versions of Percona Server for MySQL, MySQL® and MariaDB®. 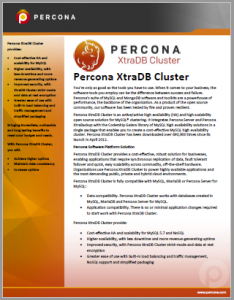 Percona XtraDB Cluster Is an active/active high availability (HA) and high scalability open source solution for MySQL® clustering. 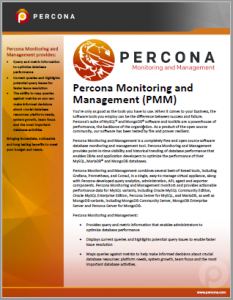 Percona Monitoring and Management is a completely free and open source software database monitoring and management tool. More and more enterprises are turning to AWS to support their database workloads – but these AWS environments still require support and expert know-how to guarantee the best performance.